So.....I ran the Javelina Jundred this past weekend. They have a 100 miler and a 100k (62 miles). I had no intention of running the 100k but when all was said and done I got a 100k belt buckle and not the 100m. I made it 77 miles. I felt like I was on Ultrarunner Candid Camera the whole weekend. Anything that could possibly go wrong......did. The mishaps actually got to the point where they were really funny. I look back now and think "Did all that stuff really happen?" Strike #1: I knew it was a bad omen when I walked into a gas station before the race and heard Bette Midler's song "Wind Beneath My Wings" playing. That is NOT the kind of garbage you want to get stuck in your head before a long, long race. Strike #2: The Javelina Jundred is a race and Jalloween party. Lots of people dress up. Before the race started I quickly realized that my costume resembled an oven. It was like being baked into a Hot Pocket. Strike #3: The costume virtually required an act of Congress to get off if, say, you need to go to the bathroom. Bad. AND I met some amazing runners. AND I got in 77 miles. AND I shared the trail with some stunning scenery. I got lots of pictures I'm very happy with. Let me narrow down the pictures and write up the review and I'll share all the blood, sweat, and tears (literally) tomorrow. There is nothing worse than getting a terrible song stuck in your head. Except for maybe the inability to quickly go to the bathroom while running. Sounds like you've got quite the adventurous story to share! I'm excited! Sorry that these things made up the perfect storm that only led you to run 77 miles instead of 100. What a wuss. I had crazy respect for anyone that runs in any costume as I just don't have it in me. 77 MILES!!! That is still 50.8 miles more than I ever hope to run. You are awesome, Cory! Thanks for the introduction to tomorrow's full write up! I hope you put it ALL out there. 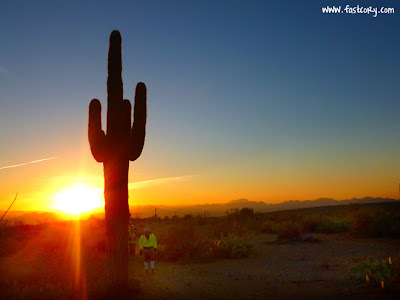 Us curious ultra runner's need to know everything please. You are still inspiring at 77 miles!! I can't even fathom 77 miles! Forrest Gump has zero on you. Ok, despite the fact that he is fictional, he still has nothing on you! :) Congrats and you looked awesome! 77 miles is still amazing. Can't wait for the full recap. (Also, that costume is TERRIFYING). 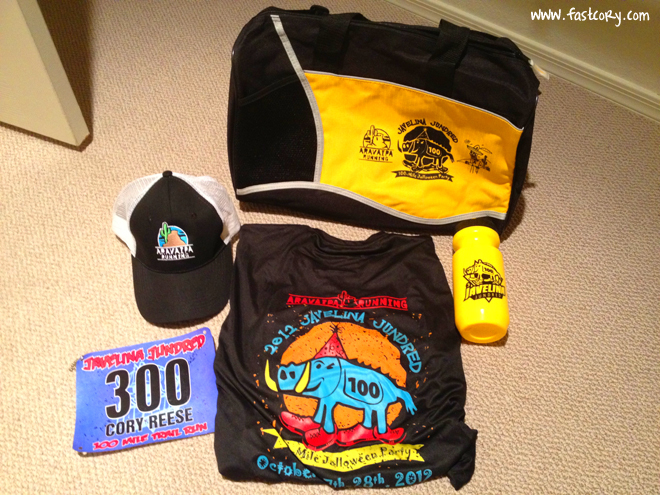 OK, seriously, that swag is enough to make me attempt the race just for all the goodies! But 77 miles...wow. Wow. In a clown costume, no less. You're crazy awesome. Don't they make clown costumes in technical fabric?!! Well there's a potential market out there. Fancy dress for fun runs(with discreet flaps for toileting purposes). Well done on your 100k. Can't wait for the full write up! I can't believe you wore that thing for 77 miles. The extra 23 should be a gimme just for that. And I really can't wait for your pictures! Seattle Hostess here... LOVED seeing you in person on the trail, Corey! The fact that you managed that trademark happy face of yours at a particularly UNhappy moment on the trail was amazing in and of itself! It was a Day of Struggle for oh so many of us. I did 67 (yes - that's 4 loops plus a little extra) and even though I really wanted 100, I could tell from the "carnage" that abounded, it wasn't likely in the cards. You rock!! 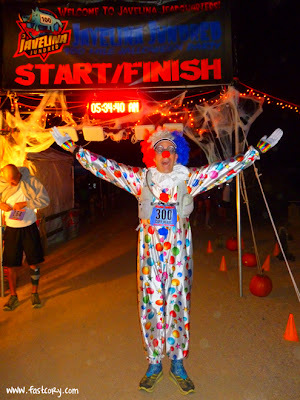 Wait, did you run 77 miles in the clown outfit? Looking forward to the photos! No - most people (including myself) shed their costumes after the first lap of 15 miles. I was SO thankful to be un-clowned! 77 freaking miles! You’re a super hero! Man, you're a stud for doing 77 miles. That's craziness! I can't wait to read the race report next! Wind beneath my wings for too many hours can cause someone to go insane!